In the last in our series of the World’s Oldest Golf Clubs, this time we turn to Bob’s new home i.e. the oldest golf club in Australia? The continent of Australia is the smallest continent by land mass but the 6th largest country in the world and consists of 6 states, New South Wales, Queensland, Western Australia, Victoria, South Australia, & Tasmania, and the Northern Territory, all with their own unique and beautiful golf courses and of course local history. However, in order to locate the oldest club, we have to travel to Tasmania…In the very early 1800’s, the new colony was then called Van Diemen’s Land and was being colonised and good farmland was being sought, especially by the Scots English, Welsh & the Irish farmers. The Reid family was one of many famil that set sail from Scotland on the ship “The Castle Forbes”, in search for a better life and future for his family. After being granted land on the Upper Clyde River north of Hobart in The Highland Wilderness, they and other Scottish families that had travelled with them from East Scotland, settled in a small village called Bothwell and thus in 1822 Ratho Farm was established. Four generations of the Reid family worked and improved The Ratho farm and golf links until 1932 when Alexander III, sold the farm to another Scottish Businessman named Alexander Stenhouse, who bought the farm for the security of his granddaughters. After the death of their grandfather Richard & Mary Ramsey, they took over the farm in 1982 and the Ramsay family have continued to upgrade the farm right up until today. The Ratho Golf Links is a unique course, as it has sheep that graze on the playing area that keep the grass nice and short, & fences are put up to stop the sheep grazing on the ‘square’ greens, there is also a unique statue of old Tom Morris carved out of a tree stump with a chainsaw. Many of the Scottish settlers also built golf courses in the surrounding area and one of those golf courses was Bothwell Golf Club. Greg Ramsay and his family have done an excellent job in bringing the Ratho Farm Golf Links into the 21 century. 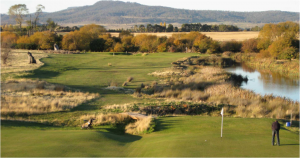 Not only can you play a round of golf on Australia’s oldest golf course but you can also go Fly fishing on the River Clyde that runs through the property, as well as staying overnight in cottages built by the convicts. N.B. Finally, as a footnote to this series of articles, my wife and I had the pleasure in staying overnight at Ratho Farm Golf Links in one of the small cottages built by the convicts in the 1800s. After playing the course with hickory golf sticks, after a great meal in the evening and whilst sitting outside our cottage with a cold beer, we watched the River Clyde flow by, the peace and tranquillity was so amazing. What an unbelievable experience having walked and played golf where so many had played before me, and for which I thank Greg Ramsay and his family for making us so welcome!